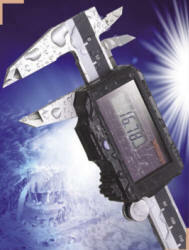 The Super Solar Caliper gets its power from light, eliminating the need for batteries. IP-67 Protection ensures excellent performance in harsh environments. With no origin reset necessary, measuring can begin immediately and there is no overspeed error. The linear encoder with ABSOLUTE System has eliminated the need to reset the origin after switching the instrument on. Also, origin reset is not required even when data is re-displayed after disappearance due to insufficient illumination during use. World’s unique* solar-powered Super Caliper that is eco-friendly and needs no battery! The use of a Super Capacitor provides a large-capacity charge function* that allows extended operation even in dim conditions. The display unit has better impact resistance under tough workshop conditions. This transparent cover on the display unit has been thickened and shaped to protect the whole display unit and is made from a new material that absorbs impact. This Super Caliper can be used in conditions where it is subject to considerable exposure to cutting fluids, making it reliable as a mechanical caliper. The components do not contain any harmful substances and they meet RoHS Directives.